Tom Wall, the brother of Kim Wall, speaking at a memorial service on Wednesday. 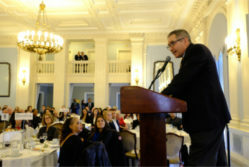 Photo: Bruce Gilbert/Courtesy of the Columbia University School of Journalism. 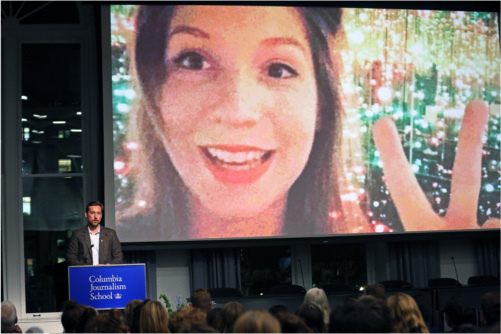 Friends, family, and teachers remembered Kim Wall at a memorial service at the Columbia Journalism School on the evening of Oct. 11. Those giving tribute to Kim, who graduated from the journalism school in 2013, focused on her love of journalism and her eclectic body of work rather than on her horrific death. 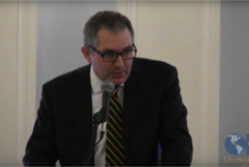 Wall was a member of the OPC and reported from the Marshall Islands in 2015 with fellow OPC members Hendrik Hinzel and Coleen Jose on the leaking Runit Dome that houses radioactive waste. 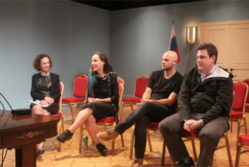 At the memorial, seven of Kim’s friends read excerpts from her work. Kim disappeared after meeting Peter Madson, a submarine builder, for an interview and a trip on his homemade submarine on Aug. 10. Her torso was later found on a beach near Copenhagen. Madsen has been charged with manslaughter, which in Danish law is the equivalent of murder. Kim’s brother Tom said she loved Muji pens, using them to take notes and write stories. “Armed with nothing but her wits, a notepad and a Japanese gel ballpoint pen, she gave a voice to those who had something to say,” said Tom. Columbia is accepting gifts to establish a scholarship named for Kim. Gifts may be made online at journalism.givenow.columbia.edu or by mailing a check to Brandon Glosser, Columbia University Graduate School of Journalism, 2950 Broadway, New York, NY 10027 and putting “Kim Wall Scholarship” in the memo field.